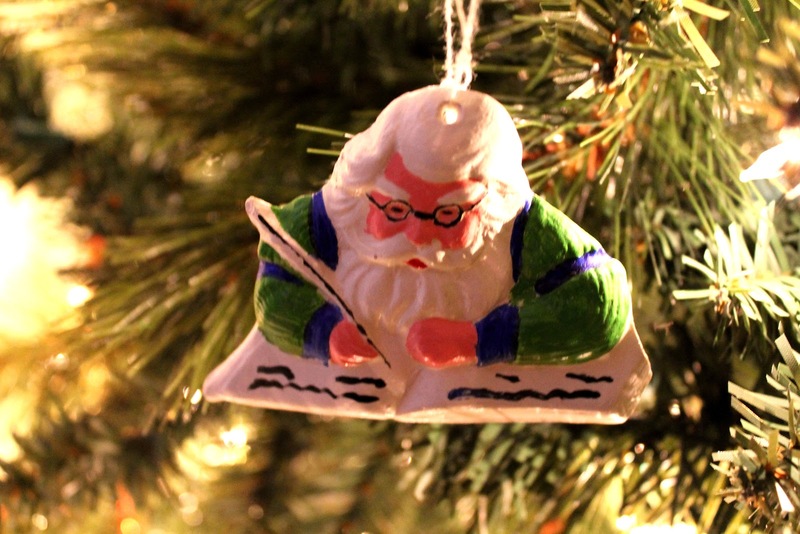 My late Grandfather's ornament. He loved birds and I think of him each time a cardinal pays me a visit. Crystal cross from an ornament exchange trade with my Mom's group years ago. For the coffee lover in the family ~me! The peacock reminds me of my mother who always had one on her tree. I loved to run my palm across the feather. My boys at ages three and four. Were they ever that small? The house to symbolize the first home we bought. My best friend gave me a new ornament every year from the Bride's Tree set similar to this one. It was a lovely tradition and each ornament is full of sentiment. 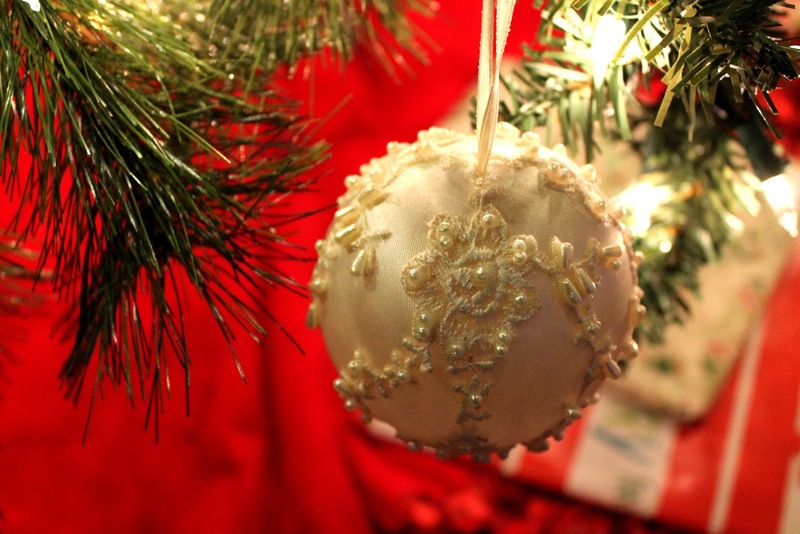 Do you know the pickle ornament tradition? You should! A hand-painted Santa made for me by my babysitter in 1979. Our wedding ball ornament. A gift from my mother that recalls my wedding gown perfectly. A wooden carved reindeer found in a quaint village shop near Chicago. Santa's gift to my eldest son last year. He still does. See our kids' tree tradition here. Beautiful tree! I love that you do the pickle. In college, when I worked at Crate&Barrel, they sold pickles with the other ornaments. I was unfamiliar with the tradition, but the other employees explained it to me. I loved telling customers about it. I should find one for our tree! 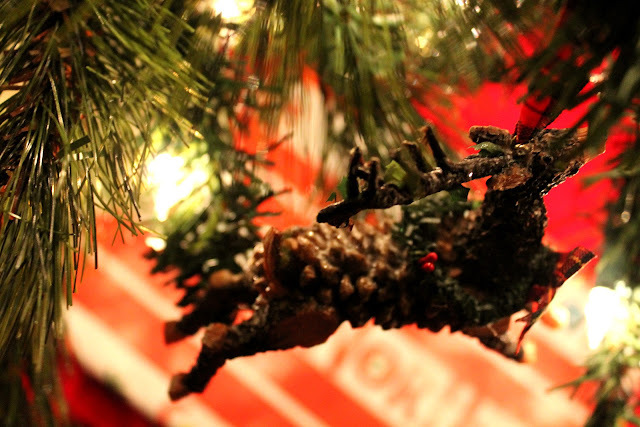 Great idea for a post...you've inspired me to blog about some of my favorite ornaments too. Lovely tree. Your wedding ornament is a great idea. Last week my mom sent me a clear ornament filled with fabric strips from my wedding reception. She had forgotten that she had it and just mailed it to me. (The funny thing is that I have been married for 18 years.) I think I appreciate it more now than if she had given it to me right after the wedding.